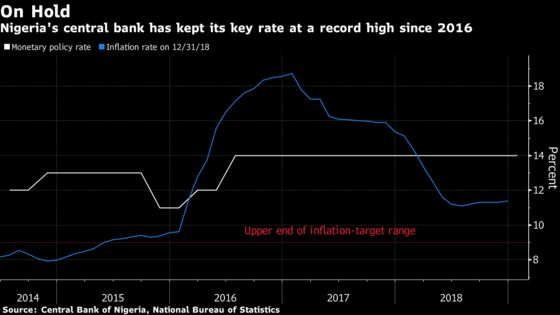 Nigeria’s central bank held its key rate at a record high as it warned of rising inflationary pressures, it said. The decision to retain the rate at 14 percent was unanimous, Governor Godwin Emefiele told reporters Tuesday in the capital, Abuja. All eight economists in a Bloomberg survey forecast the pause. By keeping the rate at this level for more than two years, the bank has sought to fight inflation, which has been outside its target range of 6 percent to 9 percent since May 2015. Price growth accelerated to a seven-month high in December. Price risks are expected to remain elevated in the first half of the year due to an increase in spending ahead of general elections next month. A “resurgence” of inflation is a concern for the bank, Emefiele said. Policymakers may also deregulate the fuel industry and plan to raise the national minimum wage by 66 percent to 30,000 naira ($83), which could add to pricing pressures. The central bank’s use of open-market operations to protect the naira and boost reserves will likely continue through the year. The MPC sees the economy expanding 2.28 percent this year, Emefiele said. That compares with 2 percent forecast by the International Monetary Fund, and 2.2 percent estimated by the World Bank.